The crowds on the square move in eddies and whirls, dragged in arcs by the gravity of drummers, snake charmers, fortune tellers and food sellers. The square of Jemaa el-Fnaa is the heart of Marrakesh, surrounded by narrow twisting souks it sits in the middle of the old city. We watch the sun set from the Grand Balcon du Cafe Glacier. As the traders and crowds change from day to night the skeletons of food stalls rise, square steel frames hung with long sheets to cover rows of dining benches. Electric lamps and gas powered kitchens make them glow from within. From our observatory we can see the touts chasing tourists below. A half-dozen strong troop of drummers in long green gowns and thick woollen hats work just below us. Two scouts orbit around the group, half heartedly clapping hand cymbals, then dropping their hats on passing tourists and dragging them back to the drumming group for photos, joking and playing along the way. After the photo comes the demand for money, causing a fierce, hand-bag clutching response in many and protracted haggling in all. They are relentless and persistent, even if not as frightening as the monkey handlers, who throw their bored, long-suffering, animals onto the shoulders of unsuspecting passers-by, then offering to take a picture. Once night arrives lights around the square illuminate the steam and smoke rising from the portable kitchens. Looking over the crowd these bright ghostly wisps rise up like spirits, dissipating and fading as they drift higher. Marrakesh has a few distinct sights worth seeing, but none for more than an hour. The ruins of the Palais El Badii hold a small interesting section of catacomb, holes in the roof letting hot white light shoot straight into the orange rock darkness. The high fortress walls are home to many storks’ nests, from which they look down enviously on the pool and sunken gardens, scared off by the visitors until closing time. In the evening the storks clack their beaks at each other and pout, reaching over backwards and shaking their beaks at the sky, wings spread wide. The most interesting old building is the Medersa Ben Youssef, an old religious school, centred around a simple large rectangular courtyard with a pool. The walls surrounding it are covered in beautiful green geometric mosaics, above those the stone walls of the many small cell-like rooms that overlook the courtyard also have finely carved patterns. Inside the rooms are small and austere, white washed with bars across the windows and dark wooden beamed ceilings, reflecting the simple monastic lives the students lived. 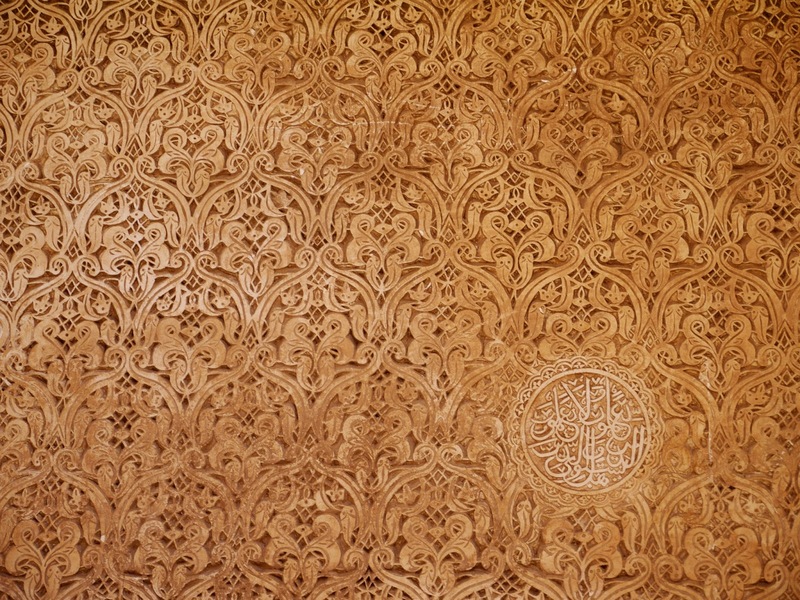 The Saâdien Tombs, lost until a French aerial survey found them again, also display intricate and pretty geometric patterns, both in tiles and carvings. These can only have been achieved with years of painstaking carving, and you imagine the stonemason’s mediative state as he spent hours chiselling away at the stone. The repeating patterns and geometric inlays are very different to the grand Bible scenes acted out in the giant paintings found in churches and cathedrals. While they appear simpler, the repeating patterns are a mediative chant for the eyes, having a visual texture and rhythm that can bring you to a state of calm and reflection. God is not represented by a scene of his power and glory drawn in Technicolor. Instead it is in the contemplation of the repeating details, the overlapping strands of colour or script that gives you a moment of clarity when you see the whole, having understood the microscopic. I wanted to be able to get lost in the small streets of the medina in the same way I could get lost in the patterns, feeling the whole old city as a non-repeating pattern. Instead of your eye wandering, you drift on your feet, randomly moving through the streets. With a map or smartphone you can always find your way out but, but unfortunately, because of the many willing 'guides' that appear as soon as your step slackens from a purposeful walk, you can't get lost. No sooner do you stop to consider a left or right turn does someone appear saying 'the big square is this way. Come, follow me'. No amount of saying no or making it clear you won't pay them deters your new and overenthusiastic helper. They walk in front of you, and if they happen to take the same turnings you do, after three turnings they want money. We tried to loose one ‘guide' by purposefully taking a turning away from the main route, hoping we'd be left alone. Naturally this turned out to be a dead end, only proving to the ‘guide’ that we needed assistance once he’d managed to find us again. From the shop keepers and stall holders you expect the invitations, the banter and the sales pitches, but it's hard to relax and just wander if every step brings out someone wanting money. All interactions are soon tinged with suspicion. Waiter won't confirm what's included in a price, even if you ask them directly and taxi drivers band together to collude on extortionate fares. In our wariness we shooed away a man one morning who was pointing us towards the tanneries we were looking for. He had to defend himself by saying "I'm not a guide, I'm a shopkeeper going to work. I don't want any money". Not everyone was trying to get money out of us, but it often felt like it. The tanneries are a strange place to visit, they’re not a really a pretty sight and you know the smell is going to be awful. It’s the call of curiosity and pulls you there, but tinged with guilt for staring at people doing an unpleasant job, knowing you’ll soon leave, and they can’t. Unusually we were happy to see a guide, offering to show us round and giving you a sprig of mint keep the worst of the ammonia smell away. The vats look they’ve been simply dug out of the red earth, in them stand people knee deep, dunking, beating and laying our strips of leather. A few stray dogs wander along the walls between the vats, I can’t imagine what keeps the dogs here, their sensitive sense of smell must be completely burned out. On the way out we’re directed through a shop of leather goods as we leave, with the owner taking us up three floors to give us an overview of the tanning pits. This shop is partially founded by the government to sell locally made goods and preserve the skills of craftsmen as shop keepers are importing more and more cheaply made Chinese goods, eroding demand for locally made goods. Another effort against the cheap imports is the Chambre d’Artisanat Morocain where there are craftsmen's workshops and goods are sold at fixed prices, to make the experience more inviting for tourists. We did come across another ‘prix fixe’ store on the Rue de La Kasbah, but going by the shelves of models made of ammunition casings, Norwegian wooden trolls and countless other shiny knick-knacks, this was a just a giant importer. After the tanneries we stop at a small white café outside the Museum of Marrakesh for a mint tea. We feel clever for aping the local habit of pouring the tea out and then back into the pot to help mix it, trying to make sure the first sip isn’t too sweet and the last isn’t too bitter. Next to the café a souk selling drapes, cloths, blankets and soft furniture is setting up for the day. A teenage boy walks to and fro, carrying all the goods from some location just out of sight around the corner. Then the shopkeeper, using a long pole with a hook on the end, hangs many of them up around the entrance, creating an enveloping jungle of brightly coloured blankets. Opposite two pottery shops are opening, selling collections of brightly painted tajine pots. They are also going through their daily ritual of spreading our their wares on small folding tables placed in front of their doors, dusting each item before putting it down. 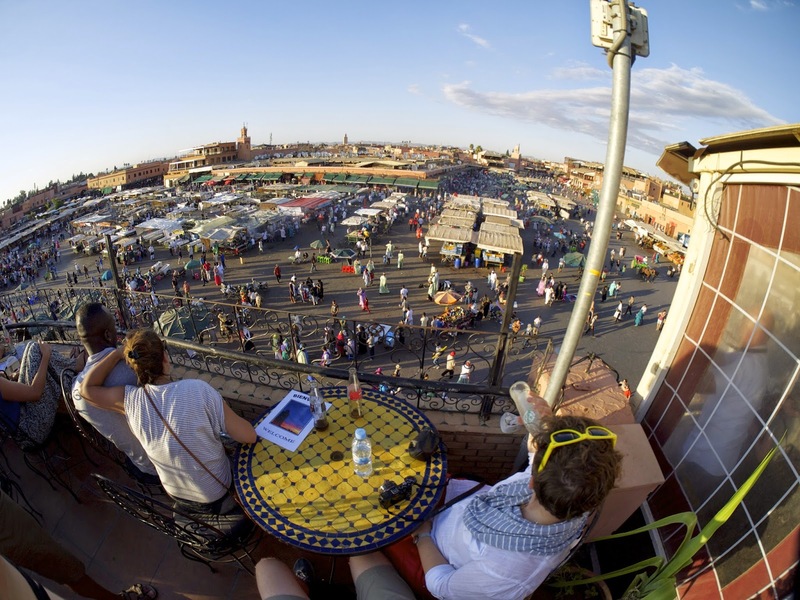 Marrakesh is no longer a trading city based on the trans-saharan camel routes, instead it trades in image and experience. Most of its business is now based on tourism, resulting in a strange combination of the exotic old world and the new consumerism. Timeless looking carpet and lantern shops sit next to stalls selling this season’s polyester football kits and t-shirts based on the latest global fashion trends. Like all good salesmen it knows what its customers want, even if those wishes run in two opposite directions. It’s not all a pantomime of the old world, especially for Jemaa el-Fnaa, where the locals flock as much as the tourists, but for different attractions. Some draws are eternal. Once the sky has become dark and distant from the lights and smells of the square, crowds gather around small troupes of storey tellers. The simple and ragged costumers, flip-flops taped to a head as rabbit ears, threadbare cloaks and exaggerated mannerism vanish in the swell of collective imagination. All that remains are stories of love, adventure, loss and humour. Things that never change here in the centre of the berber city, forever a bright beacon on the edge of the desert and mountains.